Ever make a dish and get angry that it’s so good? Not so much because it tastes good (because, yep, I do that weird thing, too), but because you’ve wasted so many nights not making it for dinner? 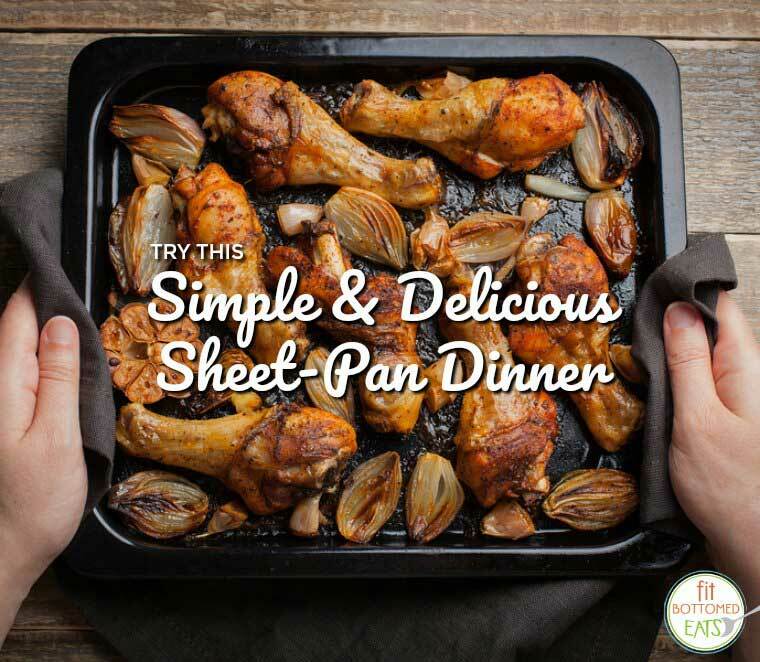 Guys, that’s exactly what this sheet pan dinner recipe is. Sheet pan dinners are not a new thing. But they’re new to me. And again, I’m pissed that I’ve waited so long to try one. With only about 10 minutes of prep time and virtually no other dishes other than the sheet plan to clean and a cutting board (I KNOW), the format is perfection. For this sheet pan dinner recipe you do need ample time to roast (about 50 or so minutes) everything to caramelized perfection, but the complex flavors are well worth the wait. And again, we’re talking 1o minutes of work and minimal cleaning for a flavorful, healthy and filling dish that is practically fool-proof. I mean, that’s pretty much my heaven, especially on a weeknight. Although, it’s one you might not want to keep all to yourself. This dish is good enough to entertain with — and enough to easily share (or have leftovers!). The recipe I settled on was adapted from this one from Real Simple. As you can see though, I made a lot of substitutions based on what I had/didn’t have in the pantry and fridge, plus I mixed things up a little differently (and it worked beautifully). It’s plenty savory and full of the hearty flavors of fall and winter, but the lemon juice and olives really give it a special depth. When your significant other takes a bite and immediately says, “So, we’re adding this to our weekly dinner rotation, right?” — you know you’ve got a winner. Winner, winner, ridiculously easy and delicious sheet pan chicken dinner! 1. Heat oven to 425 degrees. Place the chicken and veggies on a large rimmed baking sheet so that everything is on a single layer. Drizzle on lemon juice and olive oil evenly. Sprinkle on remaining ingredients evenly. Toss everything together until equally coated and back in a single layer. 2. Roast in the oven, checking on and turning the veggies every 20 minutes, until chicken and veggies are done, about 50 minutes total (depending a bit on the size of your chicken pieces).